[Diocese of Spokane] The Rt. Rev. 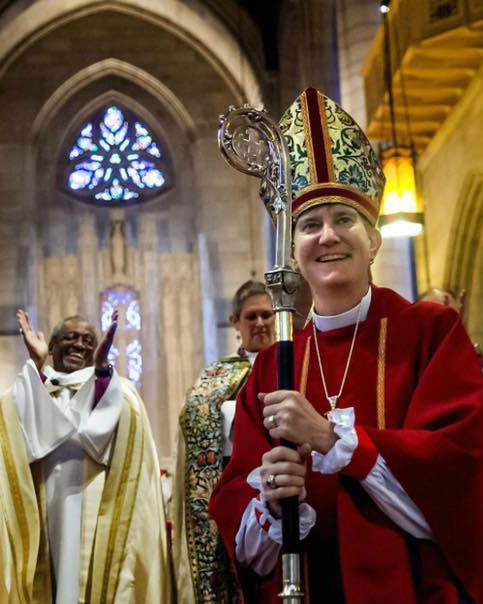 Gretchen M. Rehberg was ordained and consecrated as the ninth bishop of the Diocese of Spokane on March 18 at the Episcopal Cathedral of St. John the Evangelist in Spokane, Washington. During the course of the service, the new bishop received a number of gifts including a pectoral cross, ring, stole, miter and crozier. During the service, she was “seated” in the “cathedra” or bishop’s chair that is symbolic of the bishop’s office. More than 650 people attended the festive consecration and ordination service, and more than 6,850 joined the service by live-streaming video. Episcopal Church Presiding Bishop and Primate Michael B. Curry led the service as chief consecrator. The Rt. Rev. Katharine Jefferts Schori, former presiding bishop and primate of the Episcopal Church, was the preacher for the service. Banners representing the diocese’s congregations and several organizations led the procession of diocesan and interfaith clergy, regional dignitaries, and choristers from congregations around the diocese. The choir of more than 100 voices joined awe-inspiring carillon, brass, and pipe organ music before, during, and after the service. Following the service, worshippers enjoyed a celebratory reception in the cathedral’s Great Hall. The entire service may be viewed on the diocesan website at this link. Rehberg was elected ninth bishop of the Episcopal Diocese of Spokane on Oct. 18, 2016, during the diocese’s 52nd annual convention. Prior to her election, she was the rector of Episcopal Church of the Nativity, in Lewiston, Idaho, a position she had held since 2006. Before being elected, she served the diocese as chair of the Commission on Ministry, a canon for regional mission, and a trainer for the College for Congregational Development. In these ministries, she combined her passion for equipping people for ministry and assisting congregations in becoming more faithful, healthy and effective communities of faith. She has a master of divinity from General Seminary, a doctor of ministry from Wesley Seminary, and a doctor of philosophy in chemistry. She was a professor of organic chemistry at Bucknell University, in addition to having served her community as an emergency medical technician and firefighter. Rehberg succeeds the Rt. Rev. James E. Waggoner, Jr., who served as the eighth bishop of the diocese for more than 16 years. The Episcopal Diocese of Spokane is the Episcopal Church in Eastern Washington and North Idaho. I was delighted to read of Gretchen Rehberg’s consecretation as the ninth bishop of Spokane. She was a good friend to me, as well as to my late wife, The Rev. Carol Snell , a deacon in the Diocese of Central Pennsylvania. She is one of the most talented people I have had the privilege of knowing. We were acquainted with her when she was still professor of chemistry at Bucknell University. I recall when she decided to enter seminary. A wonderful person and talent, who I am sure will serve the Diocese of Spokane well.